From the baritone roar of the lion to a bed under the shimmering stars of a remote African wilderness… take this special time out of time to discover yourselves and a land so beautiful, it will take your breath away. 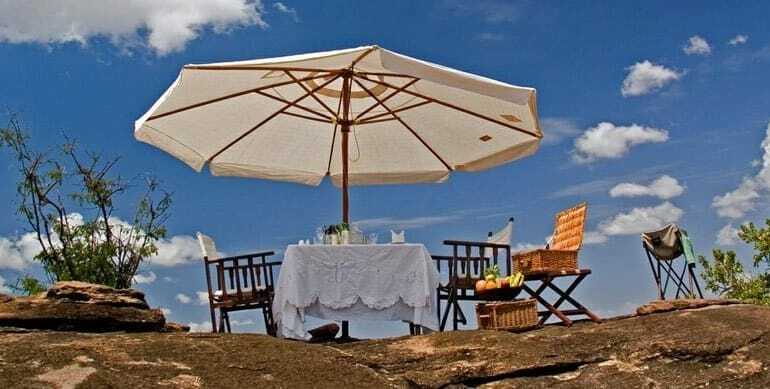 Go riding or camel trekking with Samburu warriors, enjoy elegant dining ‘bush’ style or simply dangle your feet in a clear flowing river and sip some champagne as the sun flares briefly and dips over the horizon. The soft glow of hurricane lanterns will light your way home. Simply put, this is a romantic safari, either at the start of your life’s journey together or when you want to revitalize the family and bonds you have created together. It takes you to some extraordinary places so that you can experience extraordinary moments of renewal and commitment. Instead of a noisy city hotel, we take you away immediately into the natural sights & smells of the African bush at the Emakoko in Nairobi National Park, on the outskirts of the capital city of Kenya. From there, we whisk you away to Loisaba Lodge in the highlands of Kenya, a place of deep serenity that attracts big game and guests alike to its friendly lands – a place where both types of guests are free to roam unconfined and undisturbed. From there it is off to the world famous Masai Mara. But we won’t take you to the sometimes crowded reserve – rather, you will spend your days here at Cottar’s Camp in a private conservancy not far from the Tanzanian border. This privacy and seclusion, along with the world-class guiding and wildlife at the camp will show you a very alluring aspect of the Mara. A safari full of possibilities and memories to look back on. Recommended months: All year round except April & May. This safari begins and ends in Nairobi, Kenya.